Avanda (we call her Ava) is one of our laser practitioners. She has been with the team since 2017. Ava studied at Norwich City College where she achieved NVQ Level 2 and 3 in Beauty Therapy. She then furthered her training and knowledge by completing her ‘Laser Core of Knowledge’ and she is now in the process of completing the rest of her practical assessments for all lasers that are offered here at the clinic. After completing college Ava worked in the spa industry where she loved the varied days and meeting new people. 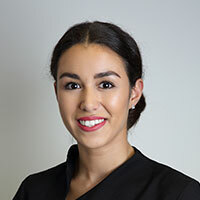 After working in spas for over 5 years Ava joined Norwich Cosmetic Clinic to further her clinical knowledge in the skin and cosmetic industry. She finds working in the clinic very interesting and rewarding. She really enjoys the results that the skin peels achieve. Ava also assists consultants Mr Beigi and Miss Murthy with their injectable and laser treatments.